Eight-year-old Rite Of Passage returned from an absence of 510 days to the scene of his 2010 Gold Cup victory when landing the QIPCO British Champions Long Distance Cup. The eight-year-old was held up towards the rear of the field by Pat Smullen but made good progress to lead inside the final 50 yards, denying the well-backed Aiken by a neck. There was a further half length back to Askar Tau in third. Smullen said: “It was a remarkable performance from horse and trainer. It is the most impressive training performance I have seen. The problems Rite Of Passage has had have been well documented and it’s a testament to the man (Dermot Weld). “He felt great through the race and the plan during the first half of the race was to hunt away, get him into a rhythm and let him warm into the race. As soon as we came out of Swinley Bottom and met the rising ground, he was on the bridle for me, so I was confident that he was running a huge race. “I was lucky to get the gap up the inside in the straight but you have to give a horse like him every chance so I went the shortest way but when you do that you’re playing with fire. “He showed his courage when he won the Gold Cup here in record time, to out-battle a very good horse on the day, and he came back on totally different conditions today. 99.9 per cent of horses would have given up at the furlong-pole but he fought his way through a gap and won well at the line. 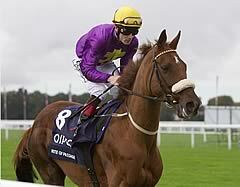 Weld said: “He is a special horse and he deserved to come back. People must remember that he set a track record when he won the God Cup but he has had ongoing tendon problems - serious tendon problems - so it is a special day to bring him back. He broke down twice with the tendon problems and has come back." “Most time I thought that he would be retired but he has always had this great will to win and it was a matter of me keeping him sound and trying to get him fit. We have had such a wet year and a wet autumn, which has made it very difficult. We would have liked to have him away to work or even work on our grass gallops, but I didn’t get to do it. “I had a huge concern over his fitness and the plan was to take our time with him, hunt early on, see if it came up for him and ride him to come home - there’s nobody better than Pat to do that. There was no pressure on Pat, I love this horse and just wanted him back in one piece. “It’s one of those very satisfying days. Every trainer has only got a limited number of good horses and we have horses like Famous Name and this horse. We have to get the maximum out of them. You have got to mind them and have them right for the big days. “This was probably one of the biggest tests that I have faced and I just delighted that he has come good on the day. We had everything - the horse, the jockey and we got the answer." Weld revealed that, as well as a return to Royal Ascot in June, that Rite Of Passage could resume his jumping career. A close finish to this Group Three, two-mile test teed up a terrific day’s racing at Ascot’s QIPCO British Champions Day. No less happy was Marcus Tregoning, the trainer of third-placed Askar Tau. Tregoning said: “He’s Mr Consistent and is always in the prize money. Surely there’s another good race in him somewhere - he’s won Group Twos and a Group Three and he’s still in such good form. “It was such a good race I thought we might finish sixth - it had three Gold Cup winners in it and it looked a tall order so I’m very proud of him. Tregoning added he would have loved to run the mare Hawaafez in today’s contest, but felt she needed another week to recover from her recent win in the Grosvenor Casinos Cumberland Lodge Stakes. 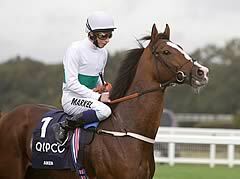 He said: “She had a hard race in the Cumberland Lodge, which is not really a mares’ race. I’m keen to keep her in training if Sheikh Hamdan will allow it and I didn’t want to run her just anywhere before a decision is made.